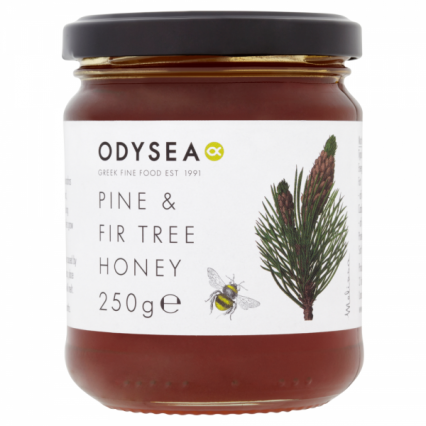 Our award-winning Odysea Pine & Fir Tree Honey now also available in a 250ml sized jar. This honey has been awarded with 2 stars by The Great Taste Awards for three years. Dietary Information: Suitable for vegetarians. Gluten free. Wheat free. Nut free. Egg free. Lactose free. Nutritional Information: Per 100g : 1413 kJ (333 kcal) Fat : 0g / Carbohydrates : 82.9g of which sugars : 56.1g / Protein : 0.2g / Salt : 0g.